koRpus is an R1 package i originally wrote to measure similarities/differences between texts. 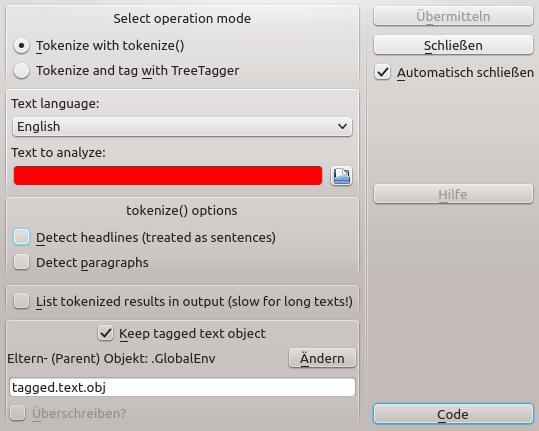 over time it grew into what it is now, a hopefully versatile tool to analyze text material in various ways, with an emphasis on scientific research, including readability and lexical diversity features. to demonstrate some of the core features of koRpus, there is a public web application2 hosted by the heinrich heine university of düsseldorf. it was realised using the shiny package3. the source files for the app come with the koRpus package, so you can also run it locally and change it to your needs. to ask for help, report bugs, suggest feature improvements, or discuss the global development of the package, please use the issue tracker4 or subscribe to the koRpus-dev mailing list5. the package has its own tokenizer, which should suffice for a lot of use cases, but to use all available features an additional installation of TreeTagger7 is strongly recommended! this means, koRpus can be used as an R wrapper for TreeTagger. Michalke, M. (2018, March). "Entschuldigen Sie, dass ich Ihnen einen komplizierten Artikel schreibe, für einen lesbaren habe ich keine Zeit" -- Textanalyse mit den R-Paketen koRpus & tm.plugin.koRpus Paper presented at the Tagung experimentell arbeitender Psychologen (TeaP), Marburg. Michalke, M. (2012, April). koRpus -- ein R-paket zur textanalyse. Paper presented at the Tagung experimentell arbeitender Psychologen (TeaP), Mannheim. if you appreciate my work an want to say "thanks", please check my wantlist on discogs21 (just have records sent to the address you find in the imprint/impressum). you're awesome! i'm still working on koRpus (see the ChangeLog). that is, as a price for progress it is possible that sometimes things won't work at all, return faulty results or will behave differently in future releases. however, in general i consider the package to be useful and usable, and i recieved several reports from variuos places where was successfully used. any feedback is most welcome! still some work needs to be done to fully validate the implementations of various measures for readability and lexical diversity. until then, those functions will trigger a warning to interpret the results with caution. help would be appreciated! the plugin gets installed/updated automatically with the R package, and recent versions of RKWard will automatically add the plugin to their configuration.